The Lok-Lift installation system that we manufacture is designed to be used within the Carpet and Rug Institute guidelines. These guidelines, specified under section CRI 102 of its carpet installation manual, state that a room should be 68 degrees, 24 hours before and after the installation, with a relative humidity of 75%. Of course, these guidelines assume a perfect situation and everybody knows that there's never a real perfect situation in the world. Since moisture is a big contributor to the failure of a Lok-Lift or any wet adhesive installation, we recommend a moisture test be done prior to any flooring installation. This is also stated in the Carpet and Rug Institute's manual, under section 102. 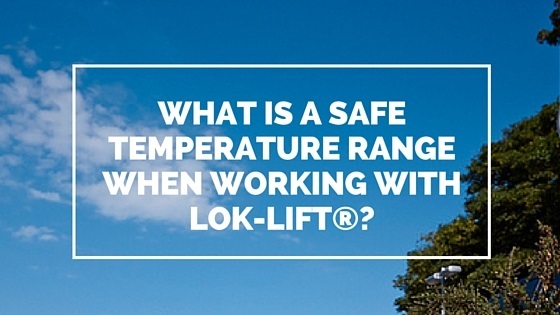 From our past experience, Lok-Lift has been installed under conditions ranging from the mid-50 to the mid-90 temperature range, and has worked fine.